24-hour forecast: Cloudy spells today and partly cloudy skies tonight with isolated showers and the chance of an isolated thunderstorm over the north or over inland areas. Today: Winds: East 5-15 kt. ; seas: Light chop - choppy. ; waves: 1-3 ft.; isolated showers. Tomorrow: Winds: East 5-15 kt. ; seas: Light chop - choppy. ; waves: 1-3 ft.; isolated showers. Marine Outlook: Saturday night:- winds: East 5-15 kt. ; seas: Choppy; waves: 2-4 ft.; isolated showers. General Outlook: Generally fair weather with only isolated showers on Sat and Sat night. Calm, clear and sunny on Ambergris Caye this morning with an expected high of 86. The weather has been consistent this week, lucky tourist! Good example of what a wind shift line looks like. Line lies across the Yucatan Channel. 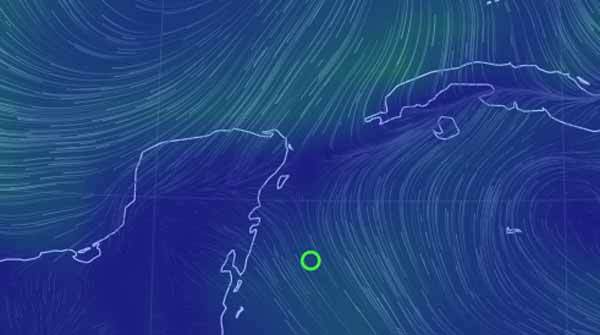 The south east wind flow across Belize is keeping the weather here hot and dry. The front in the channel is forecast to weaken and dissipate overnight.